What makes the Red Submariner tick? I will keep the technical aspects of the Red Submariner to a minimum. Due to the fact that I am not a watch maker and anything beyond the most basic of information is liable to be inaccurate. Both the Red and White Submariners are fitted with the chronometer rated in-house Rolex movement 1575 which is itself based on the 1530 movement first manufactured in 1965. When looking at the movement you will see that it is marked 1570, but because it has a date feature it is designated an additional 5. It is 28.5mm in diameter and 6.30mm in height with a 19,800 beat and fitted with a Breguet overcoil. 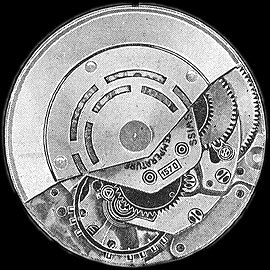 The significance of a chronometer rated movement is extreme accuracy. 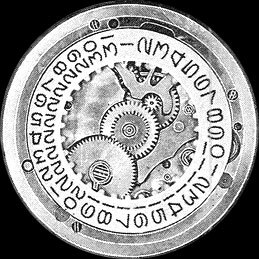 The bare movements, devoid of the date and Perpetual winding mechanism, are subject to 15 days and 15 nights of testing. During this time they are tested in 5 different positions, crown left, crown up, crown down, dial up and dial down, and at varying temperature ranging from 2°C to 32°C. Only if the movements average an accuracy of within -4/+6 seconds a day are they allowed to be endorsed as a chronometer movements. The date feature is non-quick set, the hands must be moved through 24 hours to change the date unlike modern Rolexes that have quick set date and only required a small movement of the crown to change the date. To hack or not to hack. This movement came in two designs, the earlier models have a non-hacking movement and the latter ones a hacking one. The change to hacking from non-hacking is thought to be around 1973. However, owners seem to throw doubt on this as well. Many owners have reported that their watches are fitted with the hacking feature, but dating their watches with reference to serial numbers, many of these appear to be manufactured as early as 1968, a 5 year discrepancy. You may be asking what is a hacking movement. Basically a hacking movement allows you to stop the seconds hand from moving by pulling the crown out to its furthest point. With non-hacking movements you needed to gently turn the crown backwards to a point at which the seconds hand would stop, but as soon as you let go of the crown it would start moving. A point of interest is that when Rolex introduced hacking movement, some long term users who had bought new models were so alarmed at their watch stopping dead when adjusting the time that they actually asked the company to disengaged this function on their new purchases. Bizarre, but true.